Sports brand Nike has unveiled limited-edition Air Max trainers by designers Marc Newson, Riccardo Tisci and Arthur Huang to celebrate the shoes' 30th anniversary. Thirty years after the shoes were first released, the brand has asked three designers from different fields to put their own stamp on the model. The Nike Air family of products all feature pockets of air in their soles to help cushion the feet while running. The Air Max is designed to provide maximum impact protection during repetitive landings, so has less midsole material to accommodate larger air cushions. "The original Nike Air Max was a running shoe, but it was also much more than that; it was the end product of the dreams of countless footwear pioneers," said Nike. 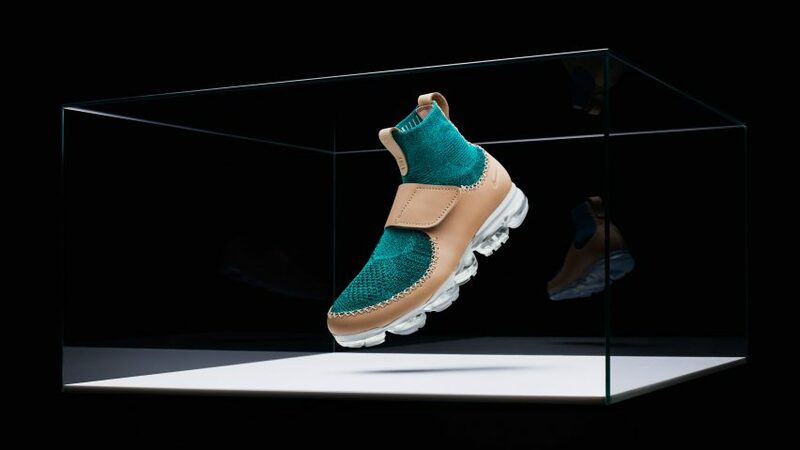 For the anniversary, industrial designer Newson has combined Nike's Flyknit material and Vapormax soles made entirely from air-filled pockets to create the NikeLab Air Vapormax. The shoe has a moccasin construction, joining a leather chassis and velcro strap frame to a pre-moulded sockliner. Nike said it provides "a lightweight and responsive underfoot feel". Italian fashion designer Tisci – who until recently served as creative director of Givenchy – is behind the NikeLab Air Max 97 X RT. His update of the 1990s Air Max includes an elevated mid-cut and a concealed zip pocket on the tongue. A translucent milky-white outsole contrasts with the synthetic leather and suede underlays of the upper, and the design is finished with foil accents. Finally, the NikeLab Air Max 1 Ultra 2.0 x Arthur Huang was designed by the Taiwanese architect and engineer who co-founded eco-design firm Miniwiz, and also created a colourful web of Flyknit material in a rusting gas tower during Beijing Design Week 2012. Huang has designed the lightest ever Air Max 1, using only recycled materials. All three of the designs are being unveiled in New York today, and will be available to purchase in limited numbers from 26 March 2017. Tisci's designs will cost $200 (£163), Huang's will be available for $250 (£204) and Newson's will be sold at $275 (£225). Newson's previous collaborations with Nike have included the Zvezdochka shoes, which first launched in 2004 and were reissued 10 years later. At the time, the brand's president and CEO Mark Parker spoke to Dezeen about how the shoes "helped pave the way for other breakthroughs" in manufacturing, aesthetics and sustainability.